This is the second lesson in a series of Japanese Art History lessons I created for children. For this lesson I focused on Japanese ink brush paintings. To see the first lesson in this series click here. There are links included throughout this post to different books and materials I used for this lesson. There is also a link at the bottom to a handout I gave my students with a brief description of sumi-e. The earliest sumi-e artists in Japan were Zen Buddhist monks. Ink brush painting was a part of their spiritual practice. This website explains beautifully the contemplative and spiritual aspects of sumi-e, its roots in Zen Buddhism and the great time and discipline that goes into mastering this art. I won't go into too much detail about the history here (read the link I provided above), but ink brush painting did develop in China first during the Tang Dynasty (618-907) and eventually was brought to Japan via Zen Buddhist monks. Like all art in Japan it was adapted and took on a style all its own. Nevertheless, it retains many similarities to Chinese ink brush painting. The same materials and the same type of strokes are used in calligrahy which is also considered an art form in China and Japan. For more information and links about ink painting see this wiki page. I read this delightful children's story aloud which includes some ink brush style illustrations. The story is based on a Japanese folktale and tells of a boy who liked to draw (or paint) cats with his brush and ink. At a time of great need one of his paintings comes to life. I have seen this story re-told in other books about Japan for children so if you don't have copy of this book at your local library you might find the folktale told in another book. Here you will find a list of some other renditions of the story. For those using Story of the World, this lesson can be a nice addition to the chapters on medieval Japan since Sesshu lived during that time period and ink painting was very popular in the 13th and 14th centuries. EXAMPLES OF ART: For this lesson I concentrated on the artists Sesshu Toyo and Ike no Taiga. There are many Japanese painters though so check out your local library for any books on Japanese art. You will likely find some lovely examples of ink brush painting to show your children. Ike no Taiga lived during the Edo Period (18th century). 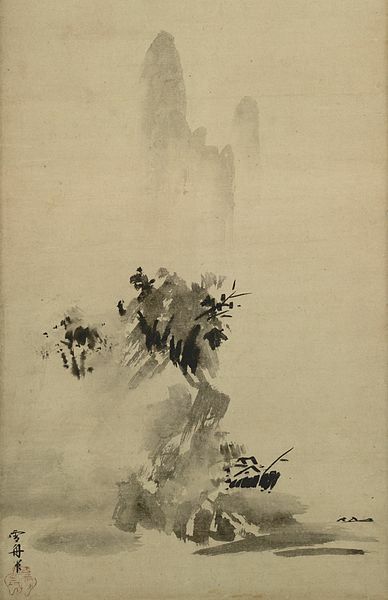 Sesshu Toyo lived during the middle Muromachi Period (15th century) and was the most important painter of his time. I used the book How to Look at Japanese Art. I especially pointed out two landscapes painted by Sesshu Toyo. One is a softer landscape (picture at the top of this post) and one is a winter landscape. I asked the children to tell me some differences they noticed in these paintings. Some things to point out: the softness and mistiness of the first landscape in contrast to the sharp angles of the second (winter) landscape. I asked which landscape had more of a feeling of harshness or coldness than the other without telling them the titles of these pictures. 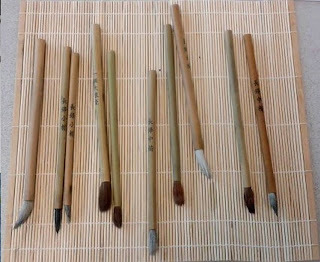 You can show your students other ink brush paintings by these or other artists found in Japanese art books from your local library or from online sources such as this. PROJECT: Sumi-e with actual sumi-e brushes, ink and rice paper. See this handout for the Japanese names for the "Four Treasures". these. The ones I purchased were of a little less quality and cost about $3 for a pack of three. Some of them came apart fairly easily, but for the most part worked fine. When I repeated the class the following semester I did purchase slightly higher quality brushes and they were more durable. I also bought a bottle of sumi-e ink to use rather than grinding an inkstone to make ink. This was easier with multiple children. I did have an inkstone and ink stick from a kit I have that I showed the children. I also demonstrated how the ink stick can be ground in the ink stone with water to make the ink. However, I used the ready made liquid ink for the project. I found the ink at my local arts and crafts store and it was similar to this. If you are doing this project with one or two children and don't want to invest in the ink you can just use black watercolor paint. Try to make it pretty thick and dark though. 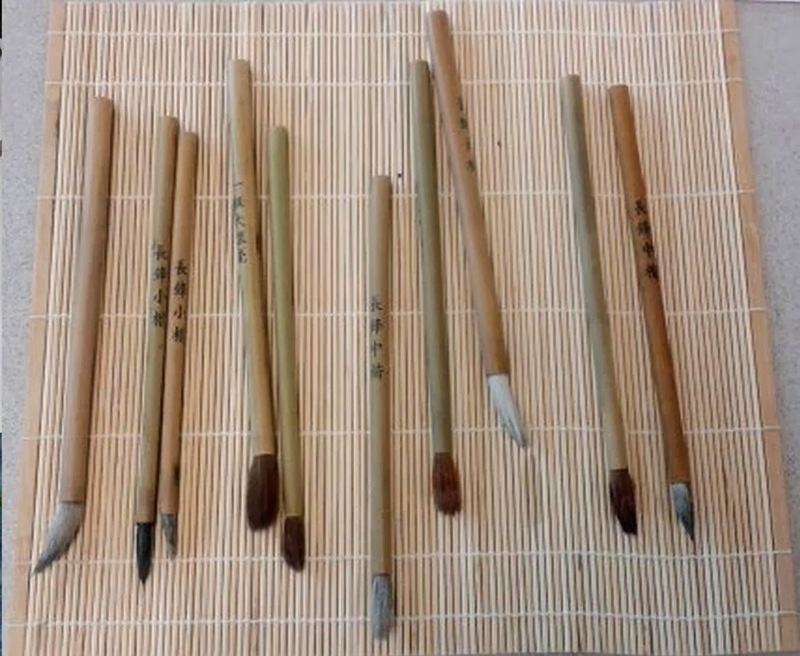 The brushes are only meant to be used with ink or watercolors. Using them with other types of paint such as acrylic will ruin them. They should be stored hanging upside down or lying flat. The children used the inkstones they made in the previous week's class from self hardening black clay. You could also use a small plastic container for the ink instead of an inkstone. We used rice paper to paint on. I also found this at my local arts and crafts store. It comes in sheets or rolls. I bought a pad of sheets so I wouldn't have to cut individual sheets for class. If you buy the roll however, you will be able to cut any length you want and make a more scroll like project. Kids really love this type of painting so they will enjoy using up a lot of the paper! The rice paper has a very distinct feel. It is very light and thin and takes some practice when painting on it. Let the kids have fun tyring out different strokes on the paper. You really need the sumi brushes as well as the rice paper for this project to give the children an authentic feel for ink brush painting. There are particular brush strokes that are traditionally taught to students of ink brush painting. I showed the children the first of these which is the bamboo stroke. I used as a guide two wonderful books on ink brush painting (sumi-e). One was the book included in the kit I mentioned above - Sumi-e: The Art of Japanese Brush Painting by Shingo Syoko. The other was The Sumi-e Book by Yolanda Mayhill. If you are really interested in sumi-e you might want to order the kit which includes a short instructional book, some small sheets of rice paper, brushes, an ink stick and an inkstone. Otherwise look for the Sumi-e Book or any other book about learning sumi-e at your local library. You can also watch this short tutorial video. It shows how to properly load the brush with ink (to simplify things I gave the children a small container with watered down liquid sumi-e ink for the gray color and I put undiluted black sumi-e ink in their homemade inkstones). The first strokes shown in the video are used to make the bamboo leaves. The side stroke is used to make the bamboo stalk. I showed the students each stroke and had them practice them a bit then I gave them a fresh sheet of rice paper and had them attempt a complete bamboo stalk with leaves. Then I gave them one more sheet of rice paper and let them have fun painting free-style. They really loved this! There are plenty of other tutorials on youtube to give you a basic idea of how to do the strokes. Just look for the bamboo stroke if you want to keep it simple. Once the strokes are learned they can be combined in various ways to paint other things. You will need to place something under the rice paper as it is very thin and the ink will leak through. I just used some butcher type paper underneath, but we were also using tables that could easily be washed. This project has the potential to be messy depending on the child so make sure your table is well protected and that the kids are wearing old clothes or smocks. It definitely depends on their age and personality as to whether they will get very messy! The children will also need a container of water to rinse their brushes and a folded paper towel to blot excess water from their brush. Make sure the children are gentle with the brushes and when dipping the brush in the ink they should wipe excess ink off of the brush on the side of the inkstone and make the brush come to a point. I also gave the students a handout that includes some basic terms related to sumi-e (ink brush painting). I went over some of these terms in class.